Cyclone brings you the freshest weather imagery available for North America, Europe, Japan, Australia including hurricane, typhoon and cyclone forecasts, tracks and projected paths and other tropical storm information. You will get real time detailed, stunning and sharp images on top of zoomable maps for not only rain and snow, but also tornados and hail. The data is provided by NOAA-NASA GOES and EUMETSAT satellites. Using the data from Storm Prediction Center and Global Disaster Alert and Coordination System (SPC & GDAC) Cyclone provides information about tropical storms and hurricanes for locations worldwide, areas affected by storms and severe weather, coordinates and wind speed, storm tracks & path projections. 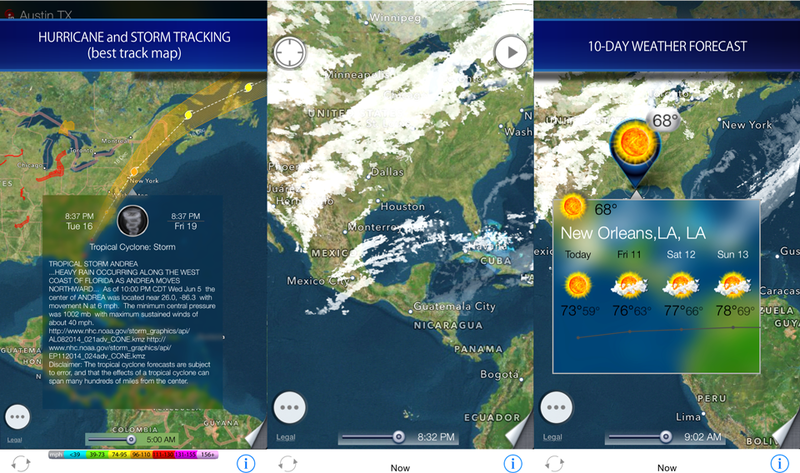 The app also allows you to check the weather on your favorite places on maps. Interactive map includes live international weather conditions, local weather and time, ten-day forecasts and sunrise/sunset times for multiple places. You can add placemarks on the map to represent your favorite places or the places you’d like to visit. At a glance you can see the time and weather for all of your favorites. Satellite images come from satellites which remain above a fixed point on the Earth (i.e. they are “geostationary”). Lighter areas of cloud show where the cloud tops are cooler and therefore where weather features like fronts and shower clouds are. * Current weather details and ten-day forecast in pop-up window.